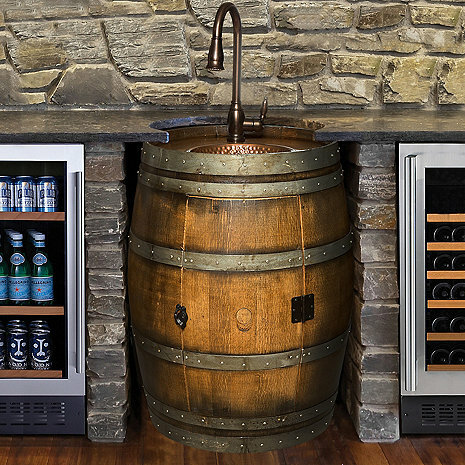 Form truly meets function when you turn your home wet bar into an instant conversation piece with this sink made from a weathered reclaimed Napa Valley red wine barrel. The deep hammered copper basin and high copper gooseneck faucet allow ample room to wash barware, wine glasses or even chill drinks. Authentic metal hoops add to the warm, rustic feel. Perfect when built in or as a standalone sink. This barrel sink is beautiful! I wasn’t sure to expect with an online order but I was pleasantly surprised. I havent noticed any change in size, I bought the sink over 8 months ago for our wine cellar. It is the perfect addition!